I would like to add that these are only the brands we have tried. If you would like to comment about a brand you have used that you liked or disliked feel free to chime in. We own four of these diapers. They are made for NB only and need covers. They also use velcro as closures. We own 7 of these diapers. 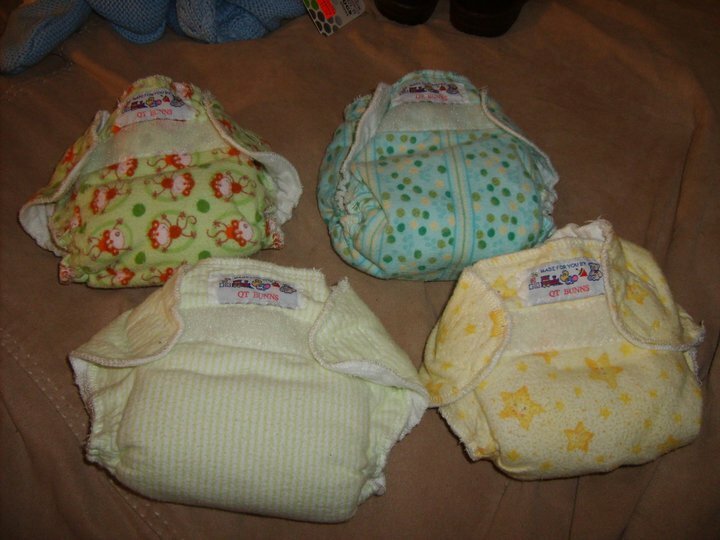 Now many of you have read my blog post about how to stay away from the seller of these diapers on eBay because he is crooked. I stand by that but the diapers themselves are fantastic, so if you can find Happy Flute diapers from a different vender GET THEM! We have one of these we borrowed it from a friend when our son was born (they lent us there diapers when he was born to start us out and as we bought our own we have been returning them. These are name brand expensive diapers so you may be surprised at the grade I give it. We own 2 and only because we already have so many and Bug is almost out of diapers. If we have another baby especially a girl anytime soon many more of this brand will be bought. We have 5 of these. We have five not because we kept buying them but because you could only buy five, 20, or 100. These we have 1 of. It was given to us, by someone who I think realized their mistake buying such a crappy expensive diaper. We own 5 of these. They are pretty great. So there you have it. 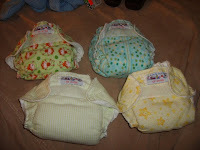 The rest of our diapers were all locally made or handmade by me... so these are the only name brand ones we own. These are honest grades based on my personal experience. Feel free to disagree or agree or talk about one you liked or disliked. Here are some more that I've tried. These are your very basic cotton prefold with a PUL diaper cover. I own 4 of these and although I've never had a problem with them we don't use them very often. They simply don't have the "cute" factor. We own 2 of these diapers. They are an AIO that come in two styles: classic velcro or Ultra which has both velcro AND snaps. Overall Grade: C+ These diapers don't look all that great when grading on this scale, but to be honest they are one of my very favorite diapers and I'll be purchasing several more when the new colors come out in the fall. Gardens, Tutus, Aprons, and Compost!